ZMG-340/390 is a NMEA Ethernet Gateway with Multiplexer for NMEA 0183 and IEC 61162-450 protocol. It is Multi-Protocol Gateway with new and innovated concept. Because, it support all of Gateway, Multiplexer and Serial switch, and also all serial protocols such NMEA 0183, Modbus-RTU, Modbus-ASCII and Binary data. Of course it supports RS-232, RS-422 and RS-485 interface signals. Thus you also can use it for general Serial to/from Ethernet Gateway with Multiplexer. Also, this Multiprotocol Gateway has NMEA 0183 to/from IEC 61162-450 Gateway. Thus you can use it for connection non-networked equipment to IEC 61162-450 ship network. Both Multiplexer and Serial switch function can be used with any Gateway function at the same time. ZMG-390 9ch NMEA Ethernet Gateway has Clustering function and can be extended up to 64ch serial in/out Gateway including Serial switch and Multiplexer. 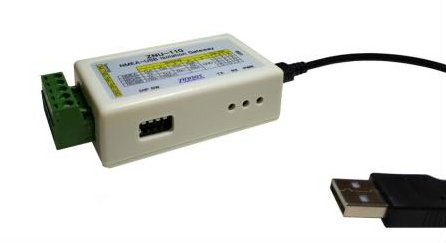 ZNU-110 NMEA-USB Isolation Gateway is an isolated two-way gateway that connects the NMEA-0183 to USB. It is designed as a multi-protocol interface to use most serial interfaces such as NMEA-0183, RS-232, RS422 and RS-485. By insulation design, it is a product that completely solves the data error and circuit breakage problem due to potential difference and surge voltage between two devices when connected with PC. ZMG-340 Serial NMEA Ethernet Gateway is 4ch Serial/NMEA to/from Ethernet Gateway and Multiplexer. It supports most serial protocols such NMEA-0183, Modbus-ASCII, Modbus-RTU and Binary Data. It also supports all of NMEA-0183, RS-232, RS-422, RS-485 and CAN signals. In addition, this ZMG-340 has NMEA IEC 61162-450 Gateway capability. 2) CAN to/from Ethernet Gateway. Serial Ports – Each Serial port is selected as Tx or Rx by internal jumper. Speed – 100kbps, 125kbps, 250kbps, 500kbps, 1Mbps. Protocol – TCP/IP UDP Unicast and Multicast. – TCP/IP TCP and HTTP for System configuration. Serial Port – Baud rate, Data Length, Parity bit and Stop bit by each channel. – If you advise good idea or improvement or any other specifications for our products, then we will strongly consider it. ZMG-340NTP Server receives time information from GPS and synchronization of internal clock and transmits the received time information to external equipment using NTP(Network Time Protocol). It is used for responding when receiving for synchronization clock request from the client. User also can passively broadcast or multicast in the place where receives to time update by using ZMG-340NTP. 4 Serial Ports – Each Serial port is selected as Tx or Rx by internal jumper. – Broadcast/Multicast Mode : User can set IP address, Port number, Period. ZMG-390 Serial NMEA Ethernet Gateway has 9ch NMEA 0183 to/from Ethernet Gateway with Multiplexer. It also supports most serial protocols such Modbus-ASCII, Modbus-RTU and Binary Data as well as NMEA 0183. And it supports all of NMEA 0183, RS-232, RS-422, RS485 and CAN signals too. 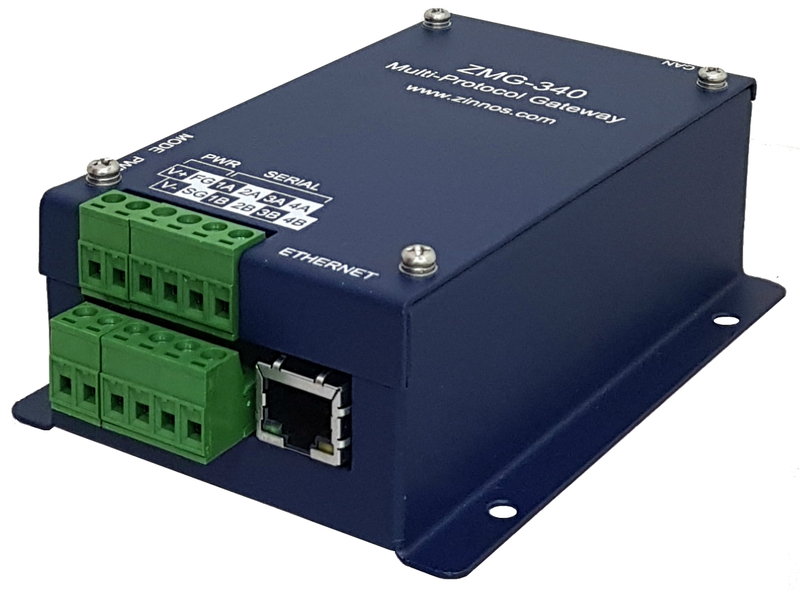 In addition, ZMG-390 has NMEA 0183 to/from IEC 61162-450 Gateway capability, which is useful for connection non-networked equipment to IEC 61162-450 ship network. 4) Clustering function, can expanded up to 64 serial/NMEA 0183 in/out. ZNU-110 NMEA-USB Isolated Gateway is basically a NMEA-0183 (IEC61162-1/2) serial to/from USB Gateway. But, it is able to process all types of serial signals such RS-232, RS-422 and RS-485 as well as NMEA 0183, caused by multi-protocol design. Most of all, Serial and USB circuit are galvanic isolated each other, this is the best solution for most communication problems and circuit breakdown by surge and very high common mode voltage. So, it is very useful for bidirectional interfacing between most serial interfaces including NMEA 0183 devices and PC, Laptop, Smart-phone and etc. This NMEA-USB Gateway does not require input power, because using USB. And it has Tx and Rx LEDs which indicates each traffic of Tx and Rx. This is designed for considering high reliable and compliance with NMEA 0183 (IEC 61162) standard. ZNU-410 4ch NMEA USB Gateway receives data from up to 4 NMEA 0183 devices and output it through one USB port. 1st input port is bi-directional(both Rx/Tx) port, and it is able to be used general USB to Serial interface for PC has no COM port. ZNU-410 supports VCP(Virtual COM Port) mode, and each port is assigned as COMn ~ COMn+3 at USB Host computer. To interface with more than four NMEA 0183 devices, two or more ZNU-410 may be used simultaneously. This is no required to set up hardware, and all parameters of serial communication are configured by host computer through USB. It is designed for considering high reliable and compliance with IEC 61162 standard. Speed Supports Both Full/High speed mode. ZNU-410 4ch NMEA USB Mux.